The peak of wildflower season in San Diego’s desert region continues this weekend, as desert dandelions, sand verbena and other colorful species blanket Anza-Borrego Desert State Park. Thanks to the consistent rain over the winter, this year’s bloom is robust and vibrant. If you’re planning a trip to the desert to see the flowers, you could start your trip at the Anza-Borrego Desert Natural History Association or the Anza-Borrego Desert State Park Visitor Center, both located along Palm Canyon. Here’s an in-depth guide on where to see those blooms. Whale watching season in San Diego typically runs from December to April, when approximately 20,000 gray whales migrate along our coast. Flagship offers daily whale watching tours to catch a glimpse of the magnificent giants of the sea, led by marine experts from Birch Aquarium, who will explain the intricacies of the ocean ecosystem. The tours are aboard the two-story yacht, the Marietta, and last about three-and-a-half hours. Weekend prices cost $48 for adults and $24 for children ages 4 to 12. Check the Flagship website for departure times, depending on the day you choose to cruise. This pop-up museum experience in Encinitas (220 North El Camino Real) has been gaining a lot of attention for its blissful exhibits inviting visitors to live, laugh and love. The “Love Tour” aims to delight the senses as visitors touch, smell, feel and listen their way through more than 21 exhibits inspired by love and happiness. The displays have also been deemed highly Instagram-worthy. General admission costs $24 for adults and $15 for children ages 4 to 15; kids 3 and under get in free. Hours vary by day; for this Friday, you can pick your time to visit between 10 a.m. and 7:30 p.m. when you buy your ticket online. Rouleur Brewing Company in Carlsbad is celebrating its second anniversary with this 5-hour, 5-course dinner and beer pairing that includes dishes whipped up by Chef Tyson Blake. At $120, the tickets are certainly a splurge, but they do include a lot of things that might appeal to craft beer and food enthusiasts: dinner, beer pairings, a limited edition second anniversary beer glass, and two 4-packs of the brewery’s anniversary canned beer. From 5 p.m. to 6 p.m., attendees can also enjoy an open bar at the brewery, plus charcuterie and cheese. Cheer on the San Diego Gulls as they play the Bakersfield Condors at Pechanga Arena San Diego Friday night. Tickets start at $22; the puck drops at 7 p.m. The San Diego Padres play their second home game of Opening Weekend at Petco Park. Watch the Friars take on the Giants – and catch some of that Manny Machado mania while you’re at it. Tickets to Friday night’s game start at $19. BeerFest goes down on this night too, which includes $5 beer specials and live music in Park at the Park before the game, from 4:30 p.m. to 7 p.m.
Barry Jenkins’ adaptation of James Baldwin’s novel, “If Beale Street Could Talk,” plays on the big screen this Friday and Saturday at Cinema Under the Stars. The movie stars Kiki Layne, Stephan James, and Regina King, and follows the story of two lovers whose bond is ruptured when one of them is falsely accused and jailed. The outdoor theater on Goldfinch Street is amid its winter/spring screening season and, since it can be a bit chilly out, the theater offers blankets, space heaters and other amenities to keep patrons warm and cozy. Admission is $18 at the box office, or you can reserve your seat in advance for $20. This weekly event in Little Italy gives you a chance to cook alongside a trained chef while discovering the community’s charming open-air farmers “mercato.” Here’s how the tour works: a chef-guide will walk with you through the market, pointing out local vendors specializing in fresh ingredients. Together, you’ll taste-test items and buy what you need to create your meal before heading to the guide’s home to partake in a cooking lesson. You’ll cook three dishes – an appetizer and two main dishes – and also enjoy a glass of wine and pannacotta for dessert. This cooking tour costs $79 per person and is usually available every Saturday. San Diego history buffs, this one’s for you. The iconic Hotel Del Coronado is currently offering a daily tour at 10 a.m. dubbed the “Legendary Tour,” which explores the landmark’s rich 130-year-old heritage. Learn about the celebrities, royalty and beach-loving families who have gravitated toward The Del over the decades, and the hotel’s most notorious guest, Kate Morgan, who checked into the hotel in 1892 whom some believe never really checked out. The 90-minute tour costs $40 for adults; kids 5 and under can join for free. You must register ahead of time. By the way, The Del is currently undergoing the first phase of a $200 million revitalization project called the “Master Plan.” It includes the preservation of historic sites and a new History Gallery. Read all about that here. Learn the art of making kimchi – a staple of Korean cuisine – at this workshop at Second Chance Beer Company. Austin Durant, of the Fermenters Club, will lead the kimchi portion of the event, while Jesse Smith, of Second Chance, takes the lead on pairing the pickled creations with the brewery’s craft suds. Attendees will get to taste kimchi and beer flights and also roll up their sleeves and whip up their own batch of spicy kimchi to take home and ferment. Tickets cost $40 to $50 and also include a keepsake souvenir beer glass. The brands that call San Diego home – from craft breweries to food and music – will come together for the “Made in San Diego Block Party,” hosted by Ballast Point Saturday in Little Italy. The 21+ bash goes down from 2 p.m. to 7 p.m. in front of the Ballast Point Tasting Room on India Street, between West Ivy and West Juniper streets. Entry is free, with a suggested donation to the Little Italy Association of San Diego. Access will be based on capacity, but a $5 donation and RSVP ahead of time is guaranteed to get you in. You can also pay $35 to $45 for a craft beer sampling package that includes unlimited 2-ounce pours of brews from homegrown favorites. Billed as the “Funkiest Disco Day on Earth,” this outdoor festival will take over downtown San Diego’s Port Pavilion on Broadway Pier Saturday with three stages of live music (funk and disco rule here), beer, and food. Attendees are encouraged to dress in their grooviest duds. Tickets cost $65; you can also tack on a ticket to the after-party at Bang Bang – a restaurant and entertainment venue on Market Street – for an extra $30. This nationwide Water Lantern Festival celebrates peace, love, and happiness at San Diego’s Chollas Lake Saturday evening. The community event invites attendees to decorate a lantern to then launch into the lake. The sight of floating lanterns dancing on the water is sure to be spectacular. The festival also includes food trucks, music, and fun activities. Adult tickets cost $35 if purchased ahead of time, and $40 at the gate and the entry includes the floating lantern. Youth tickets for children age 8 to 14 cost $12; kids 7 and under get in free, but entry does not include a lantern, which can be purchased separately for $15. Opening weekend continues at Petco Park as the Padres take on the Giants once more Saturday night. The giveaway on Saturday is a good one: a 50th anniversary “Swingin’ Friar Bobblehead.” Tickets start at $24. By the way, if you’re looking for gametime grub, here’s a guide on where to eat at Petco Park this season, focusing on homegrown favorites. Looking for a good laugh? Try a stand-up comedy show at two prime San Diego venues: downtown’s American Comedy Co. or The Comedy Store in La Jolla. This Saturday night, Texas comic Brendan Walsh (“Last Comic Standing,” “Drunk History,” “Jimmy Kimmel Live’) takes the mic at The American Comedy Co., with a 21+ show at 7:30 p.m.; tickets start at $9. Over at The Comedy Store, actor and funnyman Jon Rudnitsky (“Saturday Night Live,” “Nobody’s Fool”) headlines with shows at 7:30 p.m. and 9:45 p.m. Those tickets cost $20. Start your Sunday with a little nature walk at Mission Trails Regional Park. A trail guide will take visitors through one of three trails — the Oak Grove Loop, the Visitor Center Loop or the Riverside Grinding Rocks — while talking about the plants, animals, geology, history, and ecology of the park. These weekly guided walks are free and open to the public and begin at the Visitor Center. Wear sturdy shoes and bring water, a hat, and sunscreen. Rain cancels the walk. 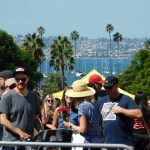 Every Sunday, from 10 a.m. to 4 p.m., a group of vendors sets up shop at Lane Field Park in downtown San Diego for this open-air market focusing on our city’s creative food, drinks, art, and craft scene. The family-friendly market typically includes live music, lawn games, pop-up installations, and other lively entertainment. It is located at 1009 N. Harbor Dr., near West Broadway, opposite of the Broadway Pier. Peruse more than 30 local artisans offering carefully-curated, handmade products at this weekly outdoor market in the Gaslamp Quarter. The Gaslamp Artisan Market sets up shop every Sunday on Fifth Avenue, between Market Street and Island Avenue. The Padres step up to the plate Sunday afternoon for their final game of Opening Weekend at Petco Park. Tickets start at $19; first pitch is at 1:10 p.m. Sunday’s game is also “Military Opening Day,” and will recognize those who serve in the U.S. military. Enjoy a free, hour-long organ concert Sunday at Balboa Park’s famed Spreckels Organ Pavilion. At the keys, the audience will typically find Raul Prieto Ramirez,the city’s San Diego Civic Organist and Artistic Director of the Spreckels Organ Society. Prieto Ramirez hails from Spain and, as he told NBC 7 last year, hopes to keep the program interesting – from Bach to Queen – at the historic Spreckels Organ. Pets are welcome, and so are picnics. Conductor Dana Sadava, narrator Nuvi Mehta, and students from the San Diego State University Community Music School come together for this symphonic telling of the classic tale of a young boy who outsmarts a wolf. Each character is portrayed by a different instrument. For instance, three horns usher in the wolf, while the clarinet signals the cat. This performance is part of the San Diego Symphony’s Family Series, so little ones are encouraged to attend with their parents. Tickets start at $10. « The 4% Interest Rates are Back!